Today is Thanksgiving Day in the United States, and I thought I would share a new find that I am thankful for on this day. Bavarian State Library, which has been for several years now digitizing and uploading 16th and 17th Century heraldic books to make them available to people like me who likely would never even know they existed except for their being uploaded on-line. So, a hearty Thank You! to the fine folks at the Bavarian State Library. That being said, the specific book I'm thankful for today is the Hofkleiderbuch (Abbildung und Beschreibung der Hof-Livreen) des Herzogs Wilhelm IV. und Albrecht V. 1508-1551. Wappen mit Reimsprüchen des Holland. Abbildungen bayerischer Regenten - BSB Cgm 1952 (16th Century). 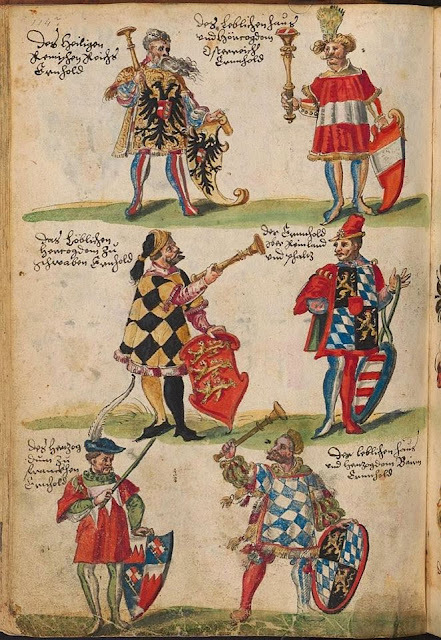 Bing translates the title as "Court dress book (illustration and description of court liveries) of Duke Wilhelm IV. and Albrecht V. 1508-1551. coat of arms with rhyming slogans of Holland. Pictures of Bavarian Regents". Which is probably close enough to get a rough understanding of what it contains. Which is a whole lot of stuff, including a page of heralds in their tabards. Enjoy! And thank you Bayerische StaatsBibliothek!